This so call "easy " pastry - cream puff has actually take up lots of our effort and few painful attempt.Why is it painful? When the puff is not puffy and is not what you expect , all the effort go in drain.. I have not done this before. The last time when we have a home made cream puff was done by my love . After he has done the best cream puff ( according to his own judgement) , he told me this is an easy pastry that he could handle it. My oh my , when your memory play you out and you thought you are right , it turn out that is a lesson for us to learn . So one fine day , we have some friends over for dinner . Run out of time , we want to make some desserts that is "easy" and in a short period of time, we decided to make cream puff. Little do we know , we totally forget about how the texture should be like and what the dough should be right for the whole cream puff thingie. The pain started when incorporate the egg into the dough , without mixing in well , we put in more flour. As we knew the dough should not be so watery. Doh ! mistakes no 1. Then we cant pipe it and is like a cookies on the baking sheet. So we make another batch, the other pain started , when mix in the flour to the butter , how the texture should be? ( At the point we have not learn the problem is the egg did not incorporate well , we thought the mistakes was in the mixing of flour into the butter) . Doh ! another mistakes no 2. All in all we make 3 batches and only the last one seem to be right. Well we are not happy with the result but our guest is happily eating all the small parthtic puff. Arghhh. Ok failure will only make us strike to get this right. Finally , after all the search and understand and realised where are mistakes was. 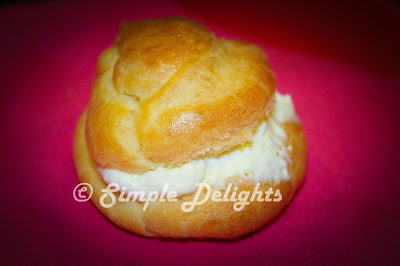 Here is the cream puff that we both knew was RIGHT ! 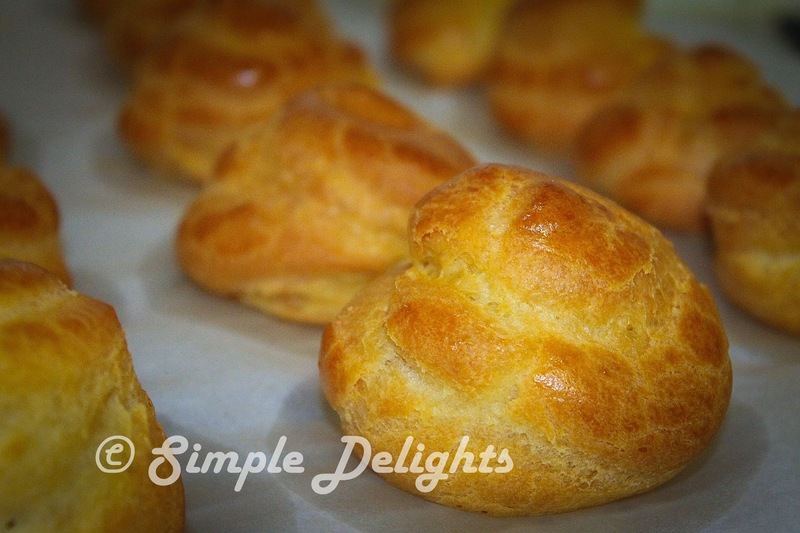 I am submitting this post to -> Aspiring Bakers #34: Choux Party (August 2013) hosted by Jasline of Foodie Baker . 1. Mix flour, baking powder,salt and sugar in a bowl and set aside. 2. Melt butter in a pot with medium heat, when butter start melting add in water and mix well. 3. Add in flour mixture quickly and vanilla essence mix well till a soft dough form and turn off the heat. The dough should be soft and shinning. 4. Set the dough aside let it cool down but not completely cool. 5. Mix in the egg one at a time and whisk the dough till the egg incorporate well. 6.Mix in another egg and continue the process. The amount of egg added in can be adjusted , the consistency we are looking for is a soft but not watery dough. The test to use here is when you put some dough between 2 finger you can stretch it to a line and it will not break and still soft. 8. Brush some egg wash on your cream puff . 9. Bake at pre-heat oven at 180C for 25mins or until golden brown. Once the puff is done , take it out from the oven cold it and pipe in your durian cream . ENJOY ! Hope this is a good guide for you to try out the cream puff making. Hi Corlin! I'm glad that you managed to get it right at the end! Now you'll be able to whip them up effortlessly from now on! :) Thank you so much for joining me in the Choux Party!